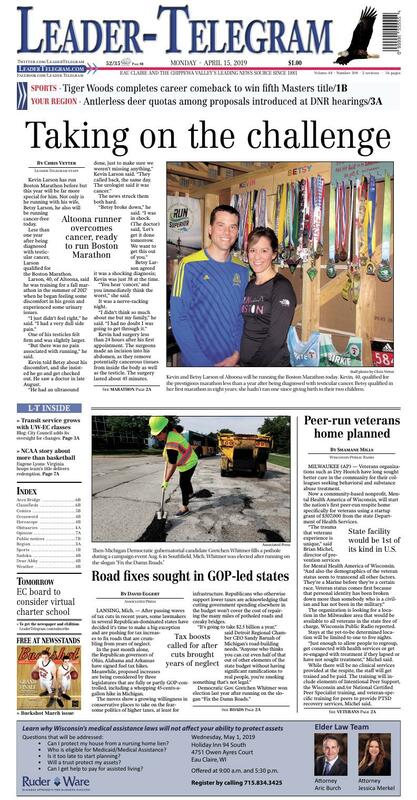 Kevin and Betsy Larson of Altoona will be running the Boston Marathon today. Kevin, 40, qualified for the prestigious marathon less than a year after being diagnosed with testicular cancer. Betsy qualified in her first marathon in eight years; she hadn’t ran one since giving birth to their two children. Kevin Larson has run Boston Marathon before but this year will be far more special for him. Not only is he running with his wife, Betsy Larson, he also will be running cancer-free today. Less than one year after being diagnosed with testicular cancer, Larson qualified for the Boston Marathon. Larson, 40, of Altoona, said he was training for a fall marathon in the summer of 2017 when he began feeling some discomfort in his groin and experienced some urinary issues. One of his testicles felt firm and was slightly larger. “But there was no pain associated with running,” he said. Kevin told Betsy about his discomfort, and she insisted he go and get checked out. He saw a doctor in late August. The news struck them both hard. Betsy Larson agreed it was a shocking diagnosis; Kevin was just 38 at the time. “You hear ‘cancer,’ and you immediately think the worst,” she said. It was a nerve-racking night. Kevin had surgery less than 24 hours after his first appointment. The surgeons made an incision into his abdomen, as they remove potentially cancerous tissues from inside the body as well as the testicle. The surgery lasted about 45 minutes. While the surgery went well and Kevin was resting at home just a few hours later, he then had to wait to hear if the cancer had spread elsewhere in his body. Kevin opted not to take pain medications, and he missed a week of work. Even though he is cancer-free, Kevin will have a blood draw every three months, and a CT scan a year for the next five years. As for running, he began the road to recovery, taking more than a month off working out. For a dedicated runner, that was a challenge. He eased back into running in October. He competed — and won — a race in the Menomonie area that fall. They decided to train for Grandma’s Marathon, which goes from Two Harbors, Minn., to Duluth, Minn., in mid-June. Kevin Larson finished in 3 hours, 1 minute, and Betsy Larson finished in 3 hours, 34 minutes. They both qualified for Boston Marathon. Mike Olson, an avid runner from Altoona, is impressed with Larson’s recovery. Olson praised Larson for being a positive competitor in the local racing scene. “At the end of every race, he always has the biggest smile, and wanted to talk about his next race,” Olson said. Wade Zwiener, an area runner who also has been a race director, said he sees Larson routinely on the loosely organized runs from Owen Park on Saturdays. About two dozen people from across western Wisconsin have signed up for the race, which features about 30,000 runners this year, the marathon’s website states. Boston Marathon competitors qualify based on a combination of their time, age and gender. Kevin Larson is an Altoona native, graduating from Altoona High School in 1997. Betsy, 37, grew up in Hartland, and graduated from Hartland Arrowhead High School. They met in college, as they both raced in cross country at UW-Eau Claire, and they each were team captains. Kevin Larson held the school record in the 800-meter dash for several years. Boston Marathon will mark Kevin’s 10th marathon, including his second time at Boston; he competed in 2016 as well. This will be Betsy’s 8th marathon, and her first-ever Boston Marathon. The Larsons have two children: 7-year-old Elodie and 4-year-old Beckham. Betsy said she continued to compete in smaller races and half-marathons but stopped running the longer distances after becoming pregnant the first time. So that meant figuring out a schedule that enabled them both get in training runs. Kevin works at Mason shoe company in Chippewa Falls, and Betsy owns and operates Elements Salon Studios in Chippewa Falls. “We basically alternate long-run days so we can get through it,” Kevin Larson said. However, Betsy said she felt strong as she worked up the miles to prepare for her first marathon in eight years. “For me, it was easier to qualify at (age) 37 than when I did when I was 22,” she said. Kevin Larson dreaded the thought of not being able to run with her again. Larson is thrilled they now get to compete together. Abbotsford: Allan "Fish" Stieber, 63. Altoona: Elizabeth Larson, 37; Kevin Larson, 40. Chippewa Falls: Nikki Bowe, 35; Kristin Mikula, 47. Eau Claire: Molly Barnes, 46; Courtney Bledsoe, 41; Rachel Drescher, 40; Laura Hickok, 47; Dene Schiefer, 42; Anne Schreiber, 22; Brent Wathke, 36. Elk Mound: Tom Chladek, Jeffrey McCalla, 45; Karen McCalla, 42. Hudson: Jill Hatch, 42; Heather Kell, 35; Brian Ostlie, 52; Duwain Wasson, 57. Menomonie: Leah Bowman, 39; Curt Henderson, 45; Amanda Molback, 32. River Falls: Martin Biel, 55; Daniel Hetchler, 53. Interstate 75 construction continues Friday in Troy, Mich. Her plan would gradually add 45 cents to the cost of a gallon of gas by October 2020, which would be more than double the current 26-cents-per-gallon gas tax and make it the highest in the country. MILWAUKEE (AP) — Veterans organizations such as Dry Hootch have long sought better care in the community for their colleagues seeking behavioral and substance abuse treatment. Now a community-based nonprofit, Mental Health America of Wisconsin, will start the nation’s first peer-run respite home specifically for veterans using a startup grant of $307,000 from the state Department of Health Services. One goal of the center is to prevent suicide. According to the state Department of Veterans Affairs, male veterans are twice as likely as their civilian peers to die by suicide. And suicide deaths among women veterans have increased by 40 percent over last decade. Kolar also spoke about ending monetary transfers from the Wisconsin Veterans Home at King. In 2016, concern surfaced over money taken from the profitable veterans’ home that was then put into the Veterans Trust Fund to cover losses.